I’ll warn you in advance, there’s a lot of hokey I-can-be-self-empowered-because-I’m-rich guru-ism in this interview done by “The Genius Network” (certainly are humble, aren’t they…) of Peter Diamantis (founder of the XPrize) and Tony Robbins. I certainly do not “love” marketing, even though I will certainly admit that my role as a sponsored athlete certainly falls under that umbrella quite often. So with that caveat… There’s also a lot of truth to what they are saying. Tony Robbins is one of those guys where it’s easy to focus on all the reasons why he’s, well, insert any pejorative adjective you like in here rather than on focusing on the content of what he says. This is common these days. Focus on the messenger rather than the message. There’s a lot of interesting and thought provoking stuff out there, sometimes in the unlikeliest of places. This is the either the problem or the foundation with most mainstream religions, depending on your perspective. A lot of the tenets are pretty basic advice about how to treat other people. Anyway, I digress… My point is, if you love Tony Robbins, I think you’ll enjoy the interview. If you hate Tony Robbins, just imagine that someone else is speaking. I listened to this interview – which my lovely wife found and sent to me – the night before the race. One of the key points Tony made, which I agree with, is that people are most often in a negative state (of mind) because they are either/both angry or/and afraid. And Tony’s solution to this is gratitude. Because it’s impossible to be angry if you are grateful. And it’s also pretty hard to be fearful if you are grateful. I had a lot of fear during the race. And a fair bit of anger too. But my solution to this, since I didn’t really have anything to lose by trying it, was to try to be grateful. The fear came early, thanks to the roughest swim I’ve ever been a part of. Rougher, even (in my opinion anyway), than Melbourne in 2013 when they shortened the swim to 1500m. I was sure that – as in Melbourne – I was going to have a disastrous swim. And it certainly seemed that way while I was swimming. Despite my best intentions and my sincere efforts to just focus on turnover and staying on feet, I lost everyone I aspired to swim with by the time I got hit by the second wave breaking on the swim out to the first turn buoy. I swam alone and exhausted, barely believing I was making any forward progress except that, somehow, the buoys seemed to be getting closer. The first non-Australian out of the water was about 5min down from the overall leader, so there’s some sense that my biggest problem going into this swim was simply not being born Australian. Or, likely, Californian. Rough water swimming is not a skill that is easily developed, especially later in life. You either grow up swimming in surf or you don’t. I did not. And while I live close to the ocean now, there’s a balance of priorities that I need to maintain in training. Kona is a deep water start in Kailua Bay. Even when it’s “rough,” it’s not really rough like this. I was better in rough water when I lived in Penticton, where the constant wind can really chop up the lake, and I would venture out for practice because of that, but I lived 400m from the beach, and that made it a sensible time investment. Regardless, I was never a great rough water swimmer, and I’m barely even good now. And, given that during the 9 days leading into the race that I was in Cairns the ocean was like glass, I neither saw a need to practice in rough conditions nor, really, even had a chance to. The ocean was like a giant pool for the better part of every day. Except race day. Somehow, by the time I exited onto the beach in Palm Cove, I had managed to lose less time per meter than I did in Melbourne, though there was a good group of guys that in most any other race I will swim right with that came out about 4min ahead of me. But in addition to thinking about just keeping my arms moving, sighting regularly because you only could see the buoys randomly depending on how the swells were, I tried to be grateful. “I’m super grateful for the chance to get sea sick during a swim, to swim by myself, to lose 20min just in the swim, and to hate this…” Oh wait, that’s not gratitude. Though I did have quite a few moments like that. But I also had some moments of, “It’s pretty awesome that I get to be out here racing again, and it’s still a long day where anything can happen.” I was pretty well spent after that swim, and had a pretty slow transition just trying to find my legs, which were quite wobbly, before setting out on my bike, unenthusiastically, in the rain. I think most people who read my ramblings with any sort of regularity will know that I hate riding in the rain. Really, I hate racing in the rain. I don’t so much dislike riding when it’s wet. It’s the need to ride fast when it’s wet. My self-preservation instincts are very high. And they are much higher after my accident. And much higher as a father of three kids. I am extremely cautious in the rain, and extreme caution and very fast cycling do not exactly mesh well. I’m sure this is what led to my first stop of the day, about 25mi into the bike, where my brakes that have grabbed fine the day before the race no longer did much more than modulate my speed; I could no longer actually stop, just slow down and not even that well. I tried – seriously – adjust my brakes while riding, though I quickly realized this was a sure fire way to crash. Like most TT bikes these days, there’s no simple barrel adjuster to tighten the brakes. So I had to stop. Thankfully, unlike some setups, there’s no complete disassembly of the bike required to adjust the brakes; just the need to insert a 2.5mm hex key (which the multi-tool I carry with me has) into the lever handle to adjust the master cylinder plunger. Up until this point, I wasn’t killing it on the bike, as that swim also tired me out a lot more than a normal 2.4mi swim does, but I also wasn’t losing much time. And I had planned to be patient anyway, as the Cairns course finishes with a long 40mi into a straight headwind. So you need to be strong at the end. But it certainly was deflating (insert foreshadowing music here…) to have to stop for 50sec to tune my brakes. In the future, I suppose I’d tighten my brakes in the morning if it was raining, but at the same time, I certainly wasn’t “on the edge” with regards to stopping power in the week leading up to the race, and I changed nothing. 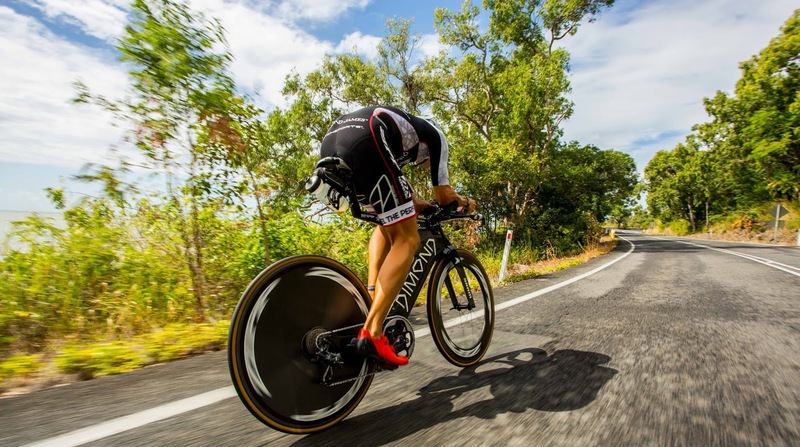 Once I was able to stop, I also felt better about being able to go, and I managed to chip away at many of the riders in front of me, most of whom had – in typical pro Ironman fashion – gone out harder than was sustainable. There are a lot of reasons for this, and I typically do it too. My goal is simply to fade less than everyone else. But I certainly fade if you compare the beginning of my races to the end. But here, because of the tough swim, I actually thought I might really negative split (by power) on the bike. And then, coming down the descent from the high point on the course, the scenic Rex Lookout, at just under 54mi (85km) into the race, I heard the worst sound in the world for a cyclist. The “hssssssssssss” of a flat tire. I hoped – and prayed maybe – that it maybe was just a wet leaf going through the frame (that sounds a lot like a flat, in case you’ve never gotten a leaf stuck on your wheel). But no, I looked down and saw sealant spraying my bottom bracket. But, then the sealant stopped spraying and the hissing died down. Sealant doesn’t always work, but it’s worked for me enough that I was optimistic. The problem was, I was riding in the wet and on a relatively technical part of the course, so without knowing just how much air I had lost or was losing, I was very tentative about riding a low tire on wet, curvy roads. Very often, riding is the best way to get a tire to seal up, because you continue to keep the sealant moving to the leak, and you squeeze the tire and tube together as you roll. But this was not the place – especially on the second lap with AG athletes around me – to risk riding on a low tire. So I pulled over, got off, and spun the tire to check the size of the hole. It was a small cut. The kind that I would say, 9 times out of 10, will seal up well. And very little sealant was leaking out. But some was continuing to bubble and leak. And now I had a real dilemma. If I waited for it to seal, and it did, I’d be better off, since I could just fill it up with CO2 (I carry two cylinders) and be on my way. And I’d still be riding on a latex tube, which on the relatively rough roads of Cairns, would be a nice advantage in terms of rolling resistance over my butyl spare for the remaining 58ish miles of the bike. But if it didn’t seal, then I’d have wasted time I could have spent changing the tire simply waiting. But it seemed like the chances were good based on how quickly the puncture had mostly sealed. So I spun the tire and waited. For how long, I am not sure. I just know that it became clear that it wasn’t going to seal. It might have been the rain – perhaps a wet tire and the high humidity made the sealant dry less quickly. It rains so rarely in California – and ever puncture is different – that I’ll probably never know. I just know that I’d now wasted a bunch of time and still had to change a flat. So I did. It was certainly not my quickest flat change ever, even once I got started, because the last time I flatted during a race in the rain – in Boise in 2009, I double flatted because I rushed it and got some debris in the tire and promptly flatted again while riding. For the record, that flat in Boise was the last time I’ve flatted in a race. This was my first flat in 22 IRONMANs. It was also my first flat ever on Specialized Turbo Cottons. These tires have been fantastic in all kinds of conditions. I’d ridden them up and down this highway all week without issue. And yes, I checked them over inch by inch before the race looking for damage. Nothing. Overall, I’ve never seen a race with so many people on the side of the road. This road was just flat central. I am not sure if there is some local tree or bush with thorns that get washed into the road when it rains, but there were a ton of flats. Which wasn’t really any solace at the time, but does make me at least feel like I wasn’t just careless on race day. So I changed my tire. Carefully. And without too much enthusiasm to get right back out there! Grateful, I was not. I ended up losing NINE minutes. And I was pretty down. I thought I’d at least just ride it in on the bike before calling it a day. But then as I got going, I tried to think about being grateful. Grateful that I had a spare and was still rolling. And my legs were actually feeling pretty good. And I’d said before the race that my goal was to be strongest in the last 40-45mi heading back to town. I still had more than half the race to go. I started pushing. I figured that I’d flown all the way to Australia, I might as well give it a go on the run. People always blow up in these races, especially when it’s as hot and humid as it was (Cairns is tropical so the rain didn’t make it much cooler, just less humid on the bike and more humid on the run). My strongest 90min were the last 90min of the race. I didn’t just not fade or fade less, I got stronger. It wasn’t my best ride, by any means, but I actually seemed to be finding my rhythm. Or at least a rhythm. Heading into the run, I figured I had nothing to lose. And there are plenty of performances I’ve seen where guys really break through on the run because they run like there’s nothing to lose and discover something about what they are capable of. I had spoken before the race about my confidence in my run, and I wanted to show it. And heading out on the run, I really felt that confidence in my stride. I was running too fast – though not way too fast – but I felt good. One big reason for this was that I did a much better job of managing nutrition. This had always been a strong point for me in the past, but I felt like I’d started to take it for granted and had slipped as a result. For this race, I put a 400cal flask of EFS Liquid Shot – in the awesome new mountain huckleberry flavor – in my T1 bag. I really needed it after this swim, and I was glad to get on the bike with 400cal in my belly. On the bike, I had two 22fl-oz bottles with nine scoops of EFS Pro lemon water (360cal each). I also had two more in special needs, which I grabbed (just before or after I flatted; can’t remember which). Plus I grabbed one bottle of electrolyte drink on course. And I had several bottles of water (360cal/22oz is too concentrated, but I’d rather grab water than calories on course because I trust the calories in EFS Pro more). So at the end of the bike, I’d taken in about 2,000 calories. Which is perfect for me. And I think it’s a huge part of why I ran well at the start. But I’d also had some problems with bonking on the run, so I had another EFS Liquid Shot in my T2 bag, and I took that in over the first hour or so of the run. I had yet another in my run special needs, but I didn’t grab it. In hindsight, I wish I had. I did start to fade some near the end of the run, and while some of that was certainly cumulative fatigue – everyone slows down in an Ironman – I also know that overall, my legs were less sore than they often are, and I think that another strong hit of calories would have been welcome. Endura – the on course electrolyte drink – was new to me, and I’m not sure how concentrated it is. So I stuck mostly to coke on the run, but in Cairns, they served the coke in plastic cups, which were harder to crush-and-drink, meaning I don’t think I got as much of each cup of coke as I should have. In general, I think I’m of the opinion that I both have the ability and the need to burn a lot of calories when I race. And more calories means better racing. For me. My friend Tim Reed raced – and won – Ironman Australia on about half as many calories, though for him, he seems to be more sensitive to how much fluid he takes in. Me, I tend to do fine even if I don’t drink a lot as long as I get the calories. Nutrition is one area where I continue to be amazed at the differences between folks. As I headed out onto the run, I asked my friend Eric how far I was out of 10th, the last place to get paid. He said I was 11th, only a few minutes back. I realized later this was an egregious lie. I was actually in 14th place, but it was much nicer to hear that I was 11th, so I thank Eric for his quick thinking here. I kept chipping away, and guys kept getting closer (and, in some cases, dropping out), and I kept moving up. I finally actually made it to 10th. Then ninth, eighth, and finally seventh with just about 2mi to go. Luke McKenzie, who flatted twice, held on for a tough sixth, ahead of me. Looking over the results, even though I lost a lot of time waiting for the tire to seal, it likely didn’t actually affect my outcome. Even had I changed my flat in super speed – say 2min, I would have been in a foot race with Jens Petersen for 5th. If I’d taken a more typical and cautious 3min to change my flat right away, I might have passed Luke, but of course that assumes Luke himself still lost all the time he lost to his two flats. Ultimately, with the tough swim, I had very little – almost zero – margin of error for the rest of the race if I still wanted to punch my ticket to Kona (meaning, pretty much, 5th or better, and – to be 99.9% sure, 4th or better). And this was a day where lots of margin of error was needed because of the conditions. Ultimately, there were some real positives from the race – my run and perseverance, some negatives – my swim, and some what-if’s and if-only’s – my brakes and my flat. It was a race that I’m proud of from a life perspective, but disappointed in from a professional perspective. That’s the best and worst part of pro sport – great performances are not always rewarded but often are; and mediocre performances are not usually rewarded but sometimes are. In terms of what’s next, I don’t know. I need to decide whether or not I want to make the push for Kona, which would require another Ironman. I feel better after this race than I have after most Ironmans, but I also know that I’ve done a lot of long racing since Ironman Mont Tremblant last year. It’s not just about getting to Kona, it’s about getting to Kona in a place to have the opportunity to perform. So, really, I just don’t know. I’m leaning towards racing again and punching my ticket to Kona, but that may change next week, as the second week post-Ironman tends to be when the fatigue really hits. ITU Long Distance World Champs are back in the US in Oklahoma in September, and that’s certainly another option. Right now, after two weeks away, I’m just trying to make up for that with my wife and kids. Last thing, since I wasn’t really sure where to stick it. I ran my 2nd best marathon ever, and my fastest since 2013, in the New Balance 1400v3. This is not their “recommended” Ironman shoe; that’s the 1500 (now 1500v2) which they co-developed with Sebastian Kienle. I raced Arizona 2015 – my first race in New Balance – in the 2015. But I raced in Oceanside this year in the 1400. And I had a great run. There are quite a few differences between the two but the biggest one – in my opinion – is that the 1400 is a shoe with 10mm of offset and the 1500 is a shoe with 6mm of offset. All of my fastest runs in races have been in shoes with 10mm of offset, including my 2:46 in Texas in 2012. But I don’t really like training in shoes with that much offset. I quite like low – very low – offset shoes for training. I run a lot in the zero offset NB Minimus trail and road. I would say that I dislike anything more than 6mm of offset for training. But when I race, I seem to run off the bike better in shoes with more offset. I had fantastic training runs in the low offset Newtons, but I always felt like my runs in races were never quite as good, relatively. There are obviously a huge number of factors at play here, but for me, I am sticking with lower offset shoes for training and higher offset shoes for racing.